She once lived in Kyoto, near Kamigamo-shrine, so knew about Kyoto very well. 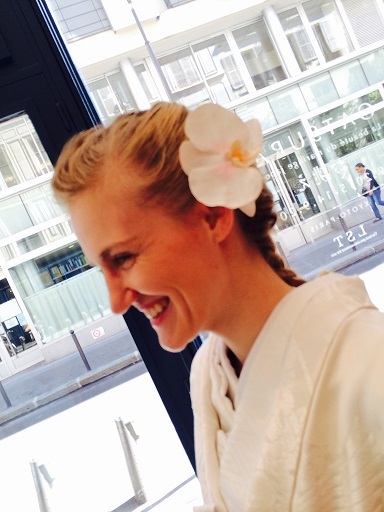 She looked great in Shiro-Muku (all white kimonos), her choice from our wedding costumes. French couple who dropped in while they were having a date. 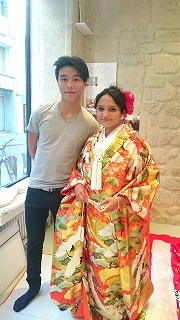 She got interested in Japanese culture through cartoon, and she was so happy to wear kimono as it has been her dream for long time. 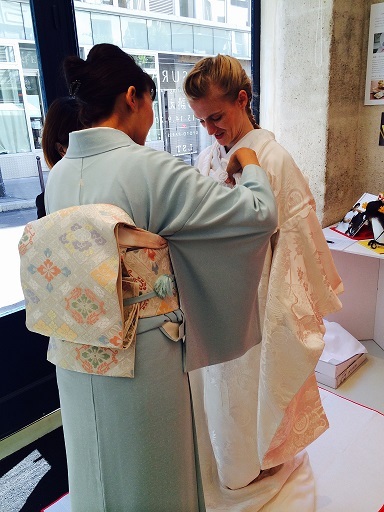 On the second day of OATSURAE-TEN, also many Parisians visited our exhibition and experienced Japanese culture. We are so happy because far more people than we expected are visiting the exhibition. Looking forward to meeting a lot of people in the remaining five days.